A tub of Dalas 'Craft Chalk Paint' in a suitable size. 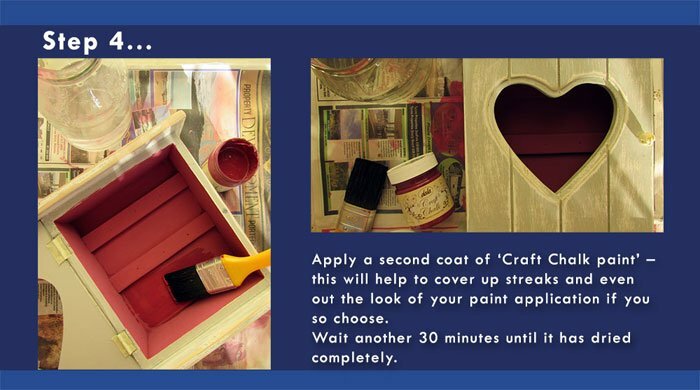 For this tutorial I used a 100ml tub of 'Paternoster' and a 100ml tub of 'Burgundy'. A paintbrush (size will depend on what you are painting). 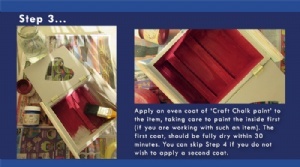 For this tutorial I used a standard black bristled brush from the hardware. Sandpaper - coarse grit and fine grit (this will all depend on the effect you wish to acheive). 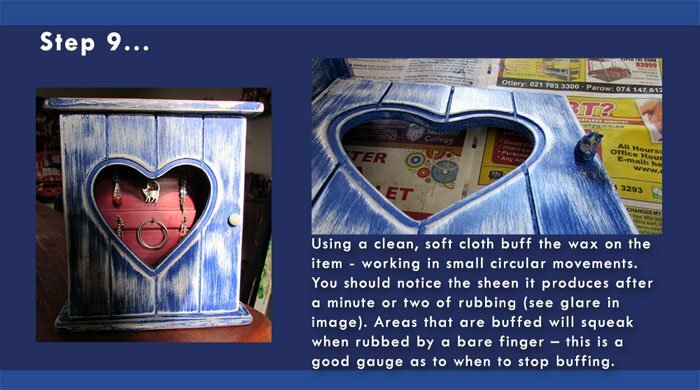 For this tutorial I mostly made use of the coarse sandpaper. 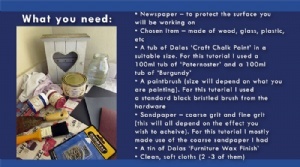 A tin of Dalas 'Furniture Wax Finish'. Have a look at your chosen object for bumps and uneven surfaces. 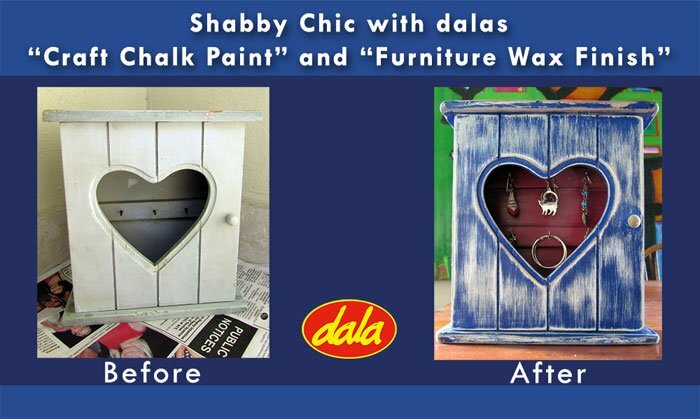 Dalas Craft Chalk paint doesn't require you to do any prep work on the item before you start painting, but if your chosen item has an uneven surface it is best to scrape and or sand the surface until it is flush. This will provide a better end result. Apply an even coat of 'Craft Chalk paint' to the item, taking care to paint the inside first (if you are working with such an item). The first coat, should be fully dry within 30 minutes. 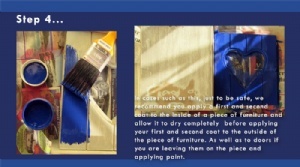 You can skip Step 4 if you do not wish to apply a second coat. 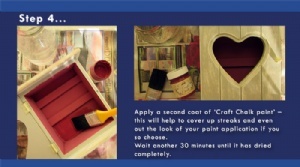 Apply a second coat of 'Craft Chalk paint' - this will help to cover up streaks and even out the look of your paint application if you so choose. Wait another 30 minutes until it has dried completely. In cases such as this, just to be safe, we recommend you apply a first and second coat to the inside of a piece of furniture and allow it to dry completely before applying your first and second coat to the outside of the piece of furniture. 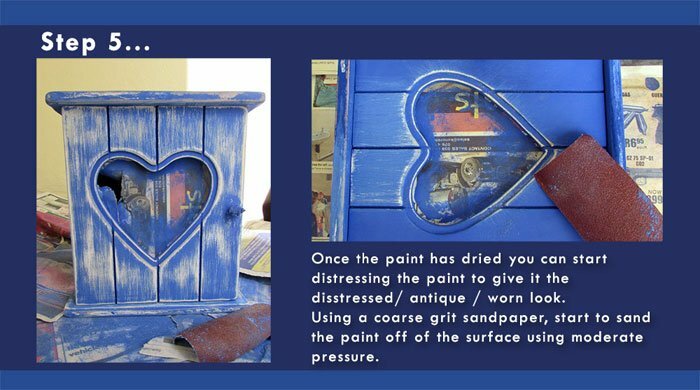 Once the paint has dried you can start distressing the paint to give it the disstressed/ antique / worn look. 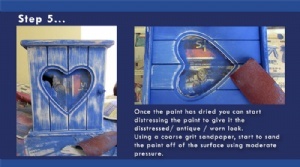 Using a coarse grit sandpaper, start to sand the paint off of the surface using moderate pressure. 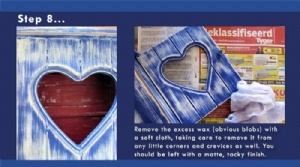 For this tutorial I worked in vertical movements (with the grain of the wood) using coarse sandpaper only. 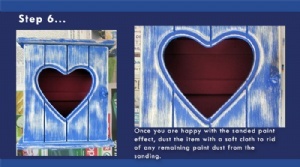 If your item doesn't have a grain or you don't want a set direction for your sanding you can combine circular motions, with horizontal lines and vertical lines. It depends on the look and feel of the distressed effect you are after. Once you are happy with the sanded paint effect, dust the item once more with a soft cloth to rid of any of the remaining paint dust from sanding. 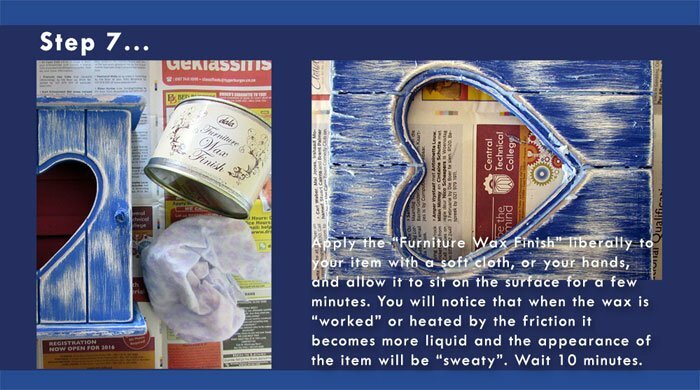 Apply the "Furniture Wax Finish" liberally to your item with a soft cloth, or your hands, and allow it to sit on the surface for a few minutes. 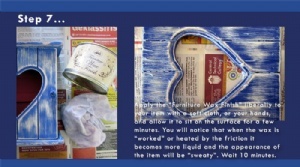 You will notice that when the wax is "worked" or heated by the friction it becomes more liquid and the appearance of the item will be "sweaty". Wait 10 minutes. Remove the excess wax (obvious blobs) with a soft cloth, taking care to remove it from any little corners and crevices as well. You should be left with a matte, tacky finish. Using a clean, soft cloth buff the wax on the item - working in small circular movements. You should notice the sheen it produces after a minute or two of rubbing (see glare in image). Areas that are buffed will squeak when rubbed by a bare finger - this is a good gauge regarding when to stop buffing. 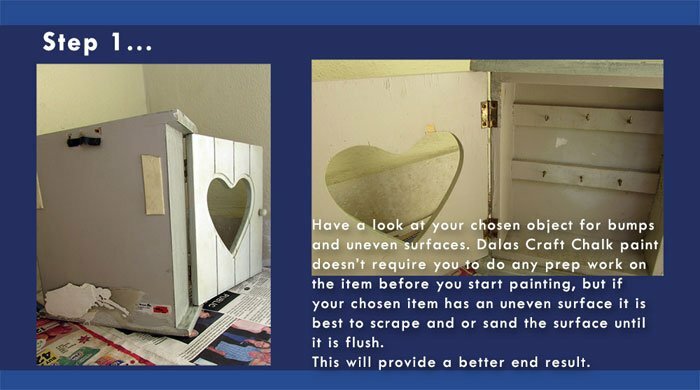 Dala's 'Furniture Wax Finish' will provide your item with a lasting and protective coating, however, if the item is to be placed in wet environments or outdoors, the item must be varnished. This item has 1003 views.